Aihole was ruled by Chalukya’s for a very long period. It became a cultural centre along with Pattadkal for Chalukyas. They have built around 125 temples in this small town. Chalukyas was a very strong dynasty which ruled most part of North Karnataka from 543-743AD. After the Chalukya period, Aihole came under the control of Rastrakutas from 9th century to 10th century. Again in 11th and 12th century Aihole witnessed the rule of Chalukyas of Kalyani who built many temples and monasteries of Hinduism, Jainism and Buddhism. Later Aihole was under many dynasties like Delhi Sultanate, Vijayanagara Empire, Adil Shahi from Bijapur, Mughal dynasty and Tipu Sultan. During this period many monuments were destroyed and rebuilt. The monuments in Badami, Aihole and Pattadkal show us the past history and tell us how great the architects were during that period of time. Aihole has its own story in Hindu mythology. It is believed that lord Parashuram who is sixth Vishnu avatar came to Aihole and washed his blood stained axe and his hands in Malaprabha River. The river turned red in colour, women who saw the river started to shout as Ayyo Hole in Kannada. Hence Aihole is also known as Ayyovole and Aryapura. Parashuram came after avenging to his father’s death. There is also a natural axe shaped rock near Malaprabha River and also the foot prints in the river. It is believed that the foot prints are of Lord Parashuram. Aihole which was the first capital of Chalukyas is called as cradle of Hindu rock architecture. Chalukyas have built many beautiful temples between 6th to 8th centuries. It is believed that the inscriptions in Aihole were composed by Jain poet Ravikeerthi, who was a court poet of Chalukya king Pulakeshi II. The inscription is written in Sanskrit using Kannada script. It mentions the achievements of Pulakeshi II especially victory over Harshavardhana king. The inscriptions also mentions about the victory of Chalukya are over Pallavas. The inscription is especially found in Meguti temple. The inscription is dated back to 635 AD. 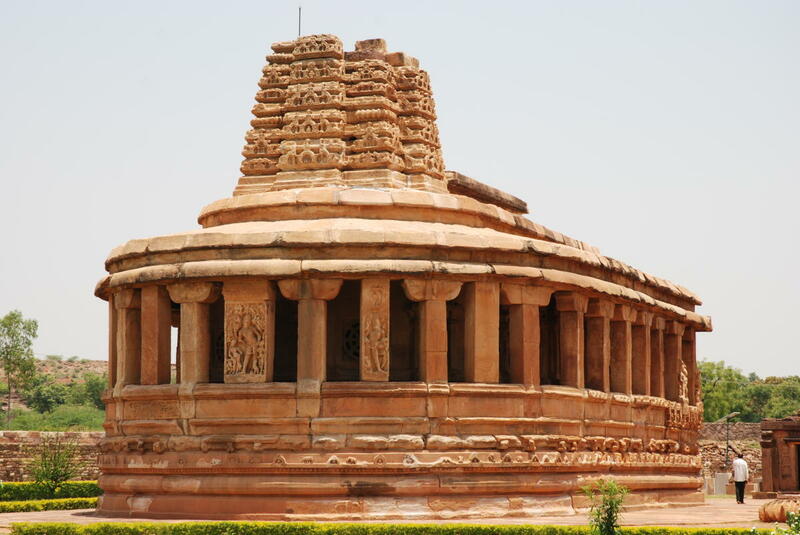 It also has the mention of Magalesha’s (king of Chalukyas of Badami ) victory over Kalachuri’s (Indian dynasty). The architecture of temples built in Aihole-Badami and Pattadkal are wonderful and worth praising. The temple in Aihole were not built ones, it was built in stages. Most of the temples were built by Pulakeshi II. The rock temple shows the craftsmanship of the artisans. Aihole has many rock cut caves temples which are beautifully sculpted with sandstone. Ravana Phadi cave temple is one of the best examples for the architecture in Aihole. It has Lord Shiva with ten arms and dancing with Saptamatrikas. Most of the Hindu temples are built in North Indian architecture which has shikaras, a gavaksa (curved arch) and amalaka ( a large stone on the Shikara). Durga temple: Durga temple complex is one of the most visited Hindu temples in Aihole. Even though the temple is named as Durga temple, however it is not dedicated to Goddess Durga. Here Durga means fortress or protector. The temple was earlier dedicated to either Lord Vishnu or Surya. The temple was built by Chalukya’s around 7th century. This temple is one of the architecture wonders of the Chalukya’s. It has impressive pillars between porch and garbha griha. The temple is oblong in shape with Dravidian and Nagara style of architecture. The temple also exhibits Indian traditional architecture known as Gajaprastha means back of the elephant. The two main pillars of the temple along the porch give access to Mukha Mantapa and Sabha Mantapa. Both the Mantapas has intricate carvings on the walls and on the ceilings. The temple has various sculptures of Gods and Goddess among them the most important sculptures of Lord Narasimha, Goddess Chamundi and Lord Shiva which are famous for its fine carvings. Since the temple has no regular worship of any shrine it can be visited any time from morning till dusk. The temple has Aihole museum and Art Gallery within the complex which is managed by Archaeological Survey of India. The museum has displayed a lot of statues that were excavated and also has collection of images like that of Lord Shiva, Saraswati, Brahma, Lakshmi, Surya, Indra and many more. Jyothir Linga complex: This temple is located to the east of Durga temple and is exclusive complex of Lord Shiva temples. The temple consists of 16 Hindu monuments that are dedicated to lord Shiva. The most important feature of the complex is the presence of stepped water tank and Trishul shaped tower. The temples were most likely built during early Chalukya and Rashtrakuta Hindu period. 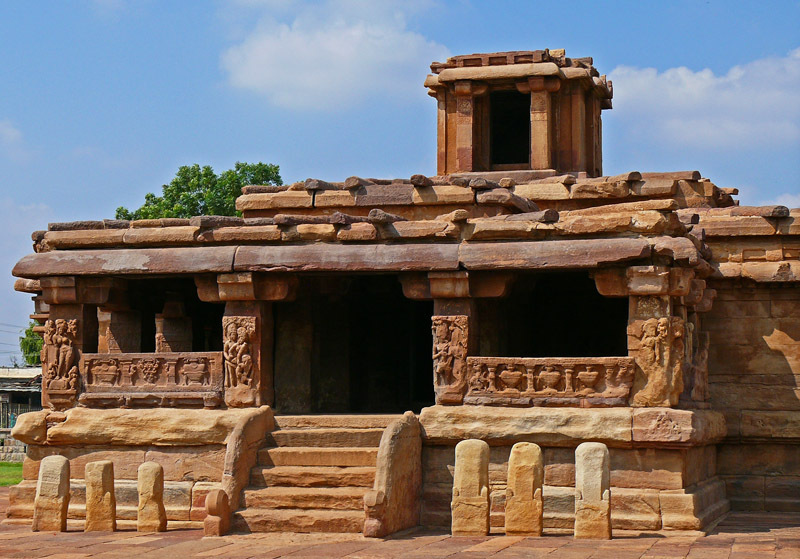 Lad Khan Temple: This is one of the oldest temples in Aihole built by Chalukya’s. It is dedicated to lord Shiva. The temple was built in 5th century and is located to the South of Durga temple. The temple is named after Lad Khan, who was a Muslim commander under Adil Shahi Sultan. He stayed in this place for a brief period. The temple was built in Panchayatana (in this main shrine is surrounded by four subsidiary shrines) style of architecture. The Mukha mandapa consists of 12 pillars which have intricate carvings on it. The tourists would certainly get mesmerized on seeing the beautiful carvings on the pillars. Earlier the temple was dedicated to lord Vishnu but now it has shrines of lord Shiva and Nandi. The temple has garbha griha along with a mandapa. The walls have beautiful floral designs on it. Lattice windows help the temple to get the natural sunlight inside the temple. The temple has deities from Shaivism, Vaishnavism and Shaktism. One can see the image of Garuda who is carrying Vishnu at the top of the sanctum of Lord Shiva. Huchhimalli temple: The temple was built around 7th century and is dedicated to lord Vishnu, Shiva. One can see intricate carvings of Kartikeya and Lord Shiva on the walls of the temple. The architecture is quiet different of this temple as compared to the other temples. For the first time the temple has built an entrance hall in front of the sanctum. Huchappayyagudi temple: Built around 7th century this temple is little away from the village. It is on the way to Malaprabha River. The temple has beautiful intricate carvings in the portico and as well as inside the temple. The portico and the sabha mandapa have four pillars and the sanctum is square in shape. The temple has carvings of Vishnu avatar, Nataraja, Shiva and different other carvings. The temple has inscriptions in Kannada on the pillars of the temple. Ambigergudi temples: This temple is situated very close to Durga temple and the complex consists of three monuments. The monument which is present in the middle is the biggest monument among the three monuments. The Shrine in the middle is of lord Sun which is damaged. The two eastern monuments are from early Chalukya’s built during 6th to 8th century. The third monument was built only by 11th century. The image of the shrine is missing in the third. There are lot of intricate carvings on the walls however most of them are damaged. Ravan Phadi temple: It is the famous and one of the most important rock cut cave temple built around 6th century AD. The style of the temple is quiet similar to that of Rameshwara cave in Ellora. The temple is very close to Durga temple complex. The ceilings of the cave have beautiful carvings of God like lord Vishnu with Goddess Lakshmi flying on the Garuda. The temple also have intricate carvings on the pillars and walls shows different deities like Shiva with Parvati, Ganesha, Kartikeya and many more. Inside the cave has three mandapas with the innermost is the Shiva linga. The entrance of the Ravanpadi temple has Nidhi and seated guardian on both the sides. Gaudargudi temple: This temple is next to Ladkhan temple. It is believed that the temple is older than the Ladkhan temple. However there is no sanctum inside the temple. It is understood from the engraved inscriptions that the temple was dedicated to Goddess Gauri. The temple has circumbulatory path which is commonly seen in most Hindu temples. Konti group of temples: It is also referred as Kuntigudi complex consists of four Hindu monuments. Inside the temple one can see mandapa which has carvings of Vaishanvism, Shaktism and Shaivism. The temple is situated in the middle of the market with the walls of the temple is between the houses in the village. The temple has various carvings on the pillars and walls like Narasimha, Ardhanarishvara, Nataraja, Gajalakshmi, Kubera, Agni, Vayu and others. Triyambakeshvara group of temples: It consists of five group of temples which is located inside the village. The main temple is towards the south the other two small temples are towards east and west. The two smaller temples are dedicated to Desiyar temple and Rachigudi temple. The grabha griha has Shiva linga with a life size nandi is facing the Linga. At the entrance of the Desiyar temple one can see seated Lakshmi having lotus in her hand. this group of temples were built in 10th or 11th century that is during late Chalukyan period. The steps at the entrance lead to Sabha mandapa which leads to garbha griha. The group consists of five hindu temples. They are located on the banks of Malaprabha River. The Ramalinga temples are dedicated to Lord Shiva. Every year there is an annual ratha procession to celebrate Aihole stone monuments heritage. The entrance of the temples has Shiva and two lion carvings. Every year the temples get white washed and decorated for the festivals. This temple was built by Ravikeerthi in 643AD. He was a minister in Pulakeshin II government. It is a Jain temple built on Meguti hill and is dedicated to Jain Thirthankara. The temple has an open balcony which takes the visitors to mandapa and garbha griha. The entire temple is on a raised platform. A huge idol of Lord Mahavira in the sitting posture and partially disfigured idol of goddess Ambika is inside the temple. The temple was built in 6th or 7th century and displays Dravidian style of architecture. 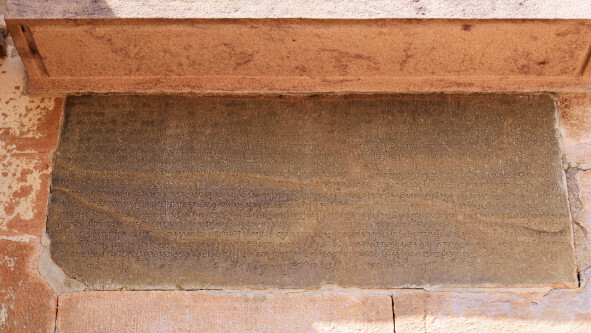 The temple is famous for its Aihole inscription that is outside the temple. It is in Sanskrit language but old Kannada script. It is a poem written by Ravikeerti about Pulakeshin II. The inscription also mentions about poets like Kalidasa and Bharavi. Truly the marvellous, magnificent temples built in Badami, Aihole and Pattadkal makes it cradle of temple architecture. The temples in Aihole are probably built at different levels because of the river Malaprabha which gets flooded and changes its course frequently. The three places is a must visit place to know about the wonderful history of Karnataka and India. Aihole has no airport and the nearest airport is at Belgaum which is a 4hr drive from the airport. The nearest railway station is Bagalkot which is around 34kms from Aihole and the nearest town is Badami. Aihole has various buses plying from major cities like Bangalore, Badami and other places. 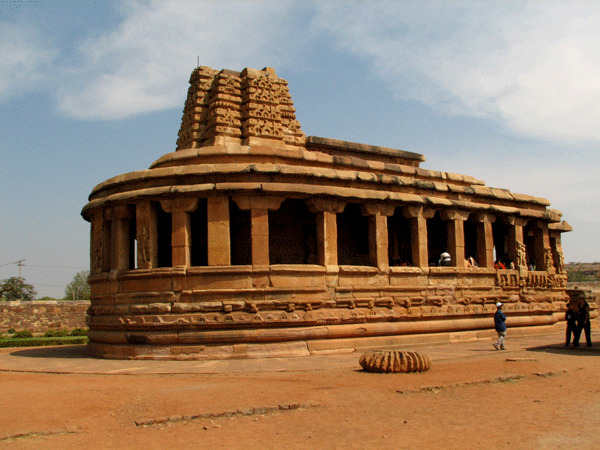 Badami, Aihole and Pattadkal are world famous tourist place which are closely located. Distance between Badami and Aihole is 35Km and distance between Aihole to Pattadkal is 14Km which is around 20mins drive.